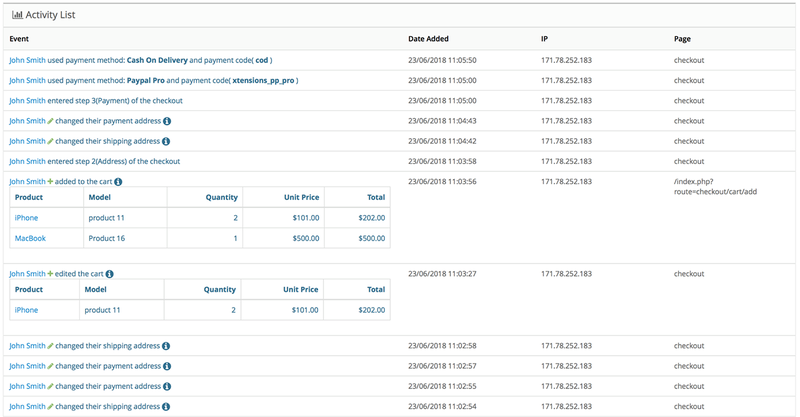 Introducing exclusive Checkout Activity Reporting, Abandoned Cart and Persistent Cart module for xtensions Best Checkout Module with following features. Be informed of how your customers are navigating checkout page. Be informed about what information your customers entered. Be informed about what errors your customers got. Be informed about time spent in checkout and each step. Be informed how customers are changing shipping method, payment methods, addresses, coupons, vouchers, reward points. Be informed how customers are editing, removing, moving to wishlist products from carts. Be informed how customers are using social login, or normal login, guest checkout or registration in your checkout. Be informed how customers are changing the language or currency in checkout page. Activity data starts getting saved since a product is added in cart and each action gets saved on checkout. See list of total orders with filter of abandoned carts. Check complete abandoned cart report. Filter abandoned cart with last step used on checkout, by name, by email, by store, by ip, by dates. Delete abandoned carts, all in a go or selected activity. Use pre defined beautiful templates or create your own. 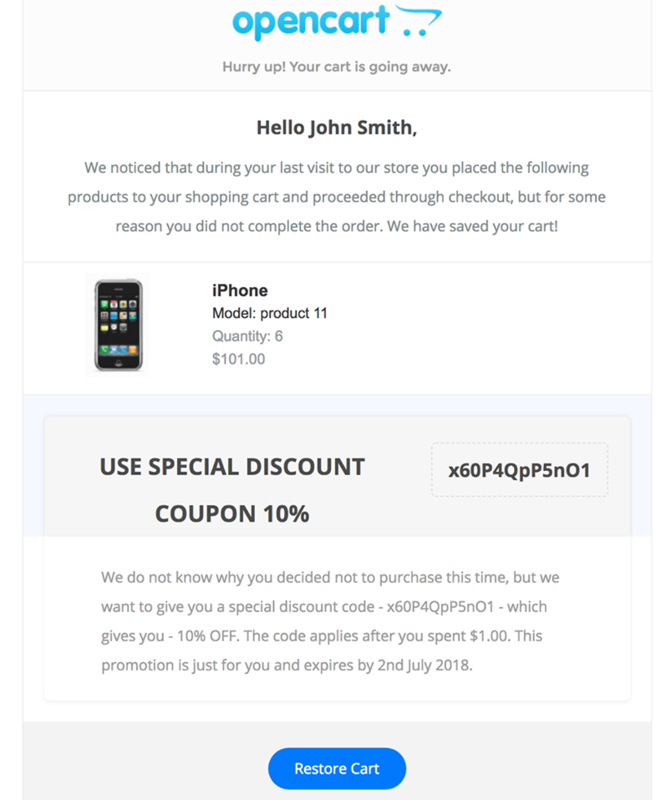 Add Coupon of your choice with inbuilt opencart coupon settings. Add dynamic data of from activity record, like firstname, lastname, cart, restore link etc. Define your own subject line. Ability to set time to send first reminder in time interval of hours or days from the time of activity started. Ability to set time to send next reminders in time interval of hours or days from the time of last mail sent. Ability to set maximum number of emails that can be sent to a user. 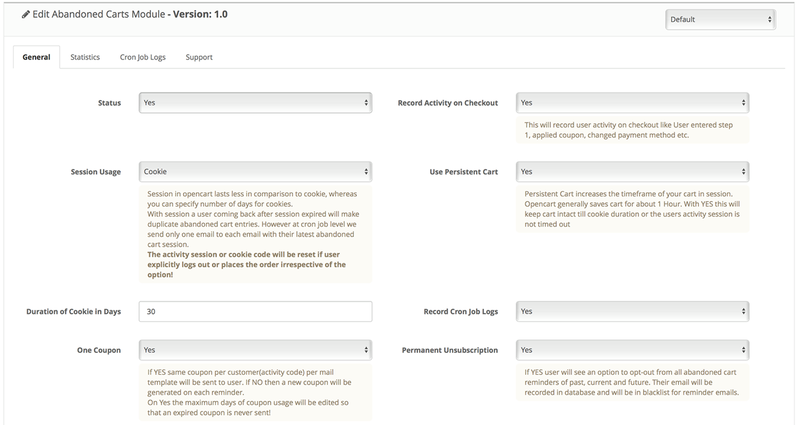 Ability to restrict to generate only one coupon per activity to not overfeed your opencart database with useless coupons. Ability to add unsubscibe link for customers to unsubscribe from activity. Ability to use(flag based) permanent unsubscibe link for customers to unsubscribe from reminders permanently for current, past or future activities. Add cron jobs directly in mail templates. Your opencart application on server should have shell access. Store based cron job, can be set to run each minute, a time of an hour, a time of a day, a date or year. 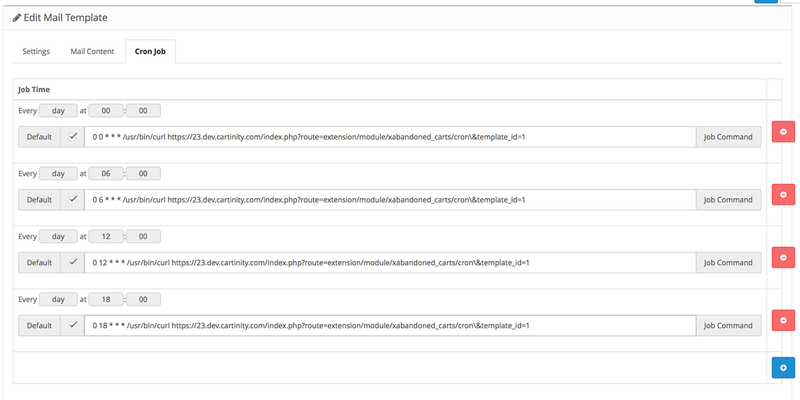 See url of cron job, so you can add it yourself if no shell access. Set Persistent Cart option to keep user's cart in browser. Use Cookie cart option to set number of days for persistent cart. 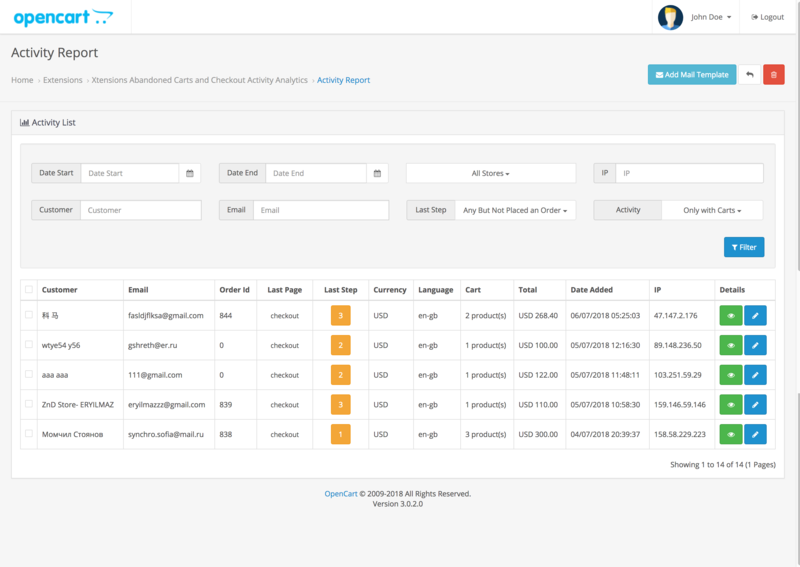 An abandoned cart module with activity tracking, like never before on opencart.